I first met Andy Cook in the university town of St Andrews a decade ago, when he was running a busy branch of one of Scotland’s most interesting independent wine merchants, Luvians Bottleshops. Over the years Andy and I became good friends, meeting at tastings and enjoying the odd meal and bottle or two together. 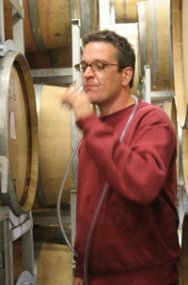 Andy also contributed a number of articles to wine-pages over the years. It was still something of a shock a few years ago, when Andy announced that he was packing in his career to head off to New Zealand where he had been accepted on a postgraduate winemaking course at Lincoln university, one of the New World’s great wine schools. I knew Andy had worked some winemaking stints in the past, but this was a new ball game. Fast forward to Autumn 2007, and I met up with Andy in Collioure, now qualified and living there with his fiancée (now wife), Kirsten. Having worked around New Zealand, Andy is now winemaker at the Roussillon estate of Coume del Mas. But over dinner that night he told me that his ambition was to stay in the Roussillon area, but to have his own vineyards and make his own wines. The first step in that is the two wines reviewed below, the first bottlings from the fledgling Cook Wines. These are not from Andy’s own couple of hectares of vineyard (which is still to come fully on stream) but are made from very carefully selected parcels of wine bought from local growers, which Andy has blended and bottled. It’s a kind of anxious moment when a friend unveils their new work and asks for an opinion, but I can honestly say that these wines are delightful: made with precision and care, and expressing both the fruit and the typicity of the Roussillon area. I anticipate Andy’s next releases with relish. Andy’s Grenache comes from a single vineyard of very old vines in the Roussillon village of Tautavel, and is unoaked. Cream and spice dominate the nose, with the blueberry and damson fruit that is ripe and appealing, but quite dark and sultry too. On the palate there’s a herbal, anise and pepper character to the fresh, cherryish fruit, before gently spicy tannins add a bit of grip and bite to this medium-bodied, fruity, yet quite powerful wine that is a fine expression of southern French Grenache. £6.99. 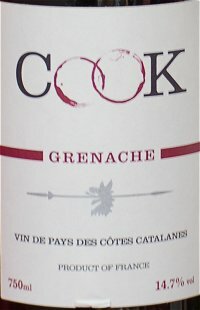 These wines may be purchased from Luvians Bottleshops in St Andrews and Coupar, or ordered online from a href=”http://www.cookwines.com” target=”_blank”>www.cookwines.com.